Ryan Lane was born in Pittsburgh, Pennsylvania on 12 January 1984. 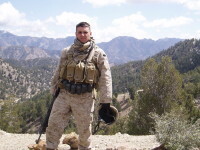 He graduated from Carrick High School in 2002 and enlisted in the Marine Corps in July of that same year. After completing recruit training on Parris Island and the School of Infantry at Camp Geiger, Lane reported to Marine Corps Base Hawaii as an 0311 Rifleman and was assigned to First Platoon Kilo Company, 3rd Battalion 3rd Marines. In 2003 he completed a deployment aboard the 31st Marine Expeditionary Unit. The following year in 2004, he deployed to Operation ENDURING FREEDOM in Afghanistan. Lane completed a tour at Parris Island with Weapons Training & Field Battalion as a Battalion Marksmanship Instructor. In 2008 he was reassigned to Delta Company, 2nd Light Armored Reconnaissance Battalion at Camp Lejeune. In 2009 he deployed again to OPERATION ENDURING FREEDOM, where he was killed in action on 23 July 2009, near Khan Neshin in Helmand Province. He is survived by his wife, Valerie.